It is immediately evident from the first few minutes into the introduction of this opera that Solti here in his Covent Garden debut was already the master of both the energy and the lyricism of the score when this live performance was broadcast by the BBC from the Royal Opera in 1959. The horns whoop ecstatically to portray the lovers’ union, then we ease gracefully into the three-quarter-time cosiness of the domestic breakfast scene and we are set fair. Sena Jurinac is a slightly lighter Octavian than the true mezzos such as Christa Ludwig or Yvonne Minton who sang the role – she herself was singing the Marschallin a few years later – but she has all the boyish impetuousness and vigour required and sings with a steady, luminous intensity in the crucial Presentation Scene. Elisabeth Schwarzkopf repeats her minutely detailed Marschallin; her word-painting is delicious. The Marschallin in another of my favourite recordings, the live Metropolitan performance under Kempe starring Lisa Della Casa, may be more restrained, refined and silvery, but Schwarzkopf’s variety of inflection is not necessarily incongruous with that strong-willed character. She is if anything earthier and less “arch” (yes, always that word when discussing her singing) than in her studio recording for Karajan three years earlier and I was pleasantly surprised by the heft of her voice as it comes across in this broadcast. Her singing at the conclusion of Act 1 is exquisite, suffused with wistful, resigned sadness at the inevitability of Octavian’s eventual departure for pastures new – and younger. The poised solo violin matches her in tenderness and the orchestral playing in general is first rate, despite a bit of poor tuning at the start of Act 2. Hanny Steffek has a slender, silvery voice and makes a lovely, light Sophie, girlish and “keck,” very much like Hilde Gueden in timbre and manner, her soprano floating sweetly through the high tessitura of her part even if occasionally she sounds a little too plaintive and slightly flat in the final duet with Octavian, but the three star sopranos combine to sing a final trio of ineffable poise and refinement, with none of the beat in the top notes sometimes encountered. About Kurt Böhme’s Ochs, I am less happy. There is no doubting the humour and vitality of his portrayal, but his voice is not intrinsically attractive in the manner of Kurt Moll or Otto Edelmann, his bottom notes are groaned and there is a lot of coarse bawling and Sprechstimme, so much of the sheer beauty of his music is subsumed into rather too oafish a characterisation, complete with the requisite Upper Austrian accent. I like the generous tone and fast vibrato of Kenneth MacDonald as the Italian Singer and it makes a change to hear in Ronald Lewis a Faninal with some voice instead of an over-the-hill character actor. Judith Pierce is a singer unknown to me, but she is a pleasant duenna to Sophie and the supporting cast is generally fine. 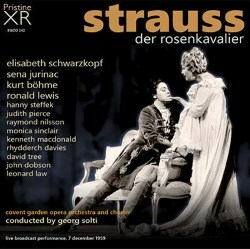 Of course, Solti went on to make a studio recording ten years later which, despite its age, continues to vie with Karajan’s as the classic account but this live broadcast goes a long way to explain why he was seen as the man to revitalise the Covent Garden opera on his appointment as Music Director eighteen months later. The sound quality is excellent, especially now that the tape has been subjected to Pristine’s usual XR remastering into Ambient Stereo, and first reveals the presence of a rather bronchial audience which eventually settles down.